A few months ago former GuestKat Mirko Brüß reported on a decision of the Court of Justice of the European Union (CJEU) concerning Geographical Indications (GIs), whisky, and a particular liquor produced in Germany. Now, the referring court has decided the case after it returned from Luxembourg. "After a CJEU decision that left much room for speculation, the Scotch Whisky Association from Scotland (TSWA) scored a first victory in a case of interest to Whisky- and IP-connoisseurs alike. As reported in this blog, TSWA took offence at the name of a Whisky that is produced by the Waldhorn distillery in Berglen, situated in the Buchenbach valley in Swabia (Baden-Württemberg, Germany). 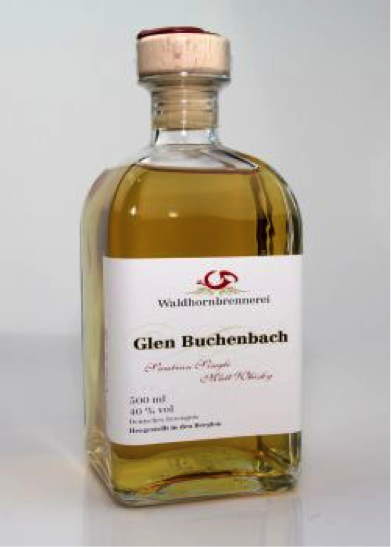 The Whisky in question is called ‘Glen Buchenbach’. 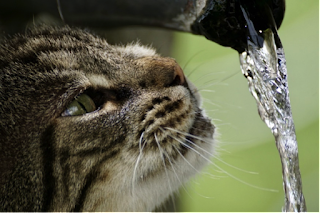 TSWA claimed that use of the term ‘Glen’ would infringe registered GI ‘Scotch Whisky’ and asserted a breach of Art. 16(a)-(c) of the Regulation No 110/2008 on the definition, description, presentation, labelling and the protection of geographical indications of spirit drinks. A direct or indirect commercial use of a geographical indication under Article 16(a) requires the actual use of the indication in an identical form or at least in a form that is phonetically and/or visually highly similar. An ‘evocation’ in the sense of Article 16(b) can occur even when no visual or phonetic similarity between the designation and the indication exists (as was the case here). The decisive criterion is whether, when the consumer is confronted with a disputed designation, the image triggered directly in his mind is that of the product whose geographical indication is protected. Any conceptual proximity between the designation and the indication needs to be taken into account. When assessing a ‘false or misleading indication’ under Article 16(c), the context in which the disputed element is used shall not be considered. It is impossible to ‘heal’ misleading indications by accompanying it e.g. with the true origin of the product. With this in mind, the District Court of Hamburg has now ruled in favour of TSWA (case No. 327 O 127/16) and enjoined the defendant from selling a Whisky which is not Scotch Whisky under the designation ‘Glen Buchenbach’. Not surprisingly, the judges found that no infringement of Article 16(a) had occurred, since ‘Glen Buchenbach’ does not make actual use of the registered indication ‘Scotch Whisky’. The Court went on to explain that no ‘evocation’ in the sense of Article 16(b) occurred. While no visual and/or phonetic similarity between the disputed designation and the protected geographical indication exist, the CJEU found that an ‘evocation’ may be found to occur even in the absence of such similarity. However, this was not the case here, since the judges saw no conceptual proximity between the designation and the indication. ‘Glen’ could not be used as a synonym for ‘Scotch Whisky’ and would also not describe the term. The fact that the term ‘Glen’ might cause a chain of associations ending at ‘Scotch Whisky’ would not be sufficient for an ‘evocation’ in the sense of Art. 16(b). As a bit of a surprise (to this former GuestKat and early Twitter commentators, at least) came the Court's finding that the use of the indication ‘Glen’ on a Whisky that is not ‘Scotch Whisky’ does in fact constitute a ‘misleading indication’, liable to convey a false impression as to the product’s origin under Article 16(c). The Court argued that the designation ‘Glen’ gives the average European consumer who is reasonably well informed and reasonably observant and circumspect the impression that this Whisky is a ‘Scotch Whisky’. Almost all Whiskys which bear the designation ‘Glen’ in their name would be Scotch Whiskys, the Court found. It would also be irrelevant that not all Scotch Whiskys bear the designation ‘Glen’, because the only decisive factor in the dispute would be whether there is a risk that consumers will think of Scotch Whisky when they hear a whisky bearing the name 'Glen' and not whether they think of 'Glen' when they hear Scotch Whisky. To conclude, the Court repeated the CJEU’s finding that the additional information on the disputed product, such as „Swabian Single Malt Whisky“ and „Deutsches Erzeugnis“ (produce of Germany) could not be used to restrict the protection of geographical indications and must not be taken into account when assessing the misleading indication. The Court’s ruling is not yet final, since the defendant can appeal the case to the Higher Regional Court of Hamburg. The question whether a bottle of ‘Glen Buchenbach’ will become a rarity remains unsolved." I am reminded of a patent trial before Robin Jacob, many years ago, when the QC (I think it was Michael Silverleaf) enquired of the CEO in the witness box whether he could think of any other reason, other than to mislead His Lordship, why the date on the cruciaL engineering blueprint had been changed. The witness (from Italy, answering through an interpreter) feigned not to understand the question, then added that if it had been he personally who had changed the date on the drawing he would have made a much more professional job of it. Using Tippex, it seemed, was beneath his level. Reverting to the present case, what other reason for prefixing "Buchenbach" with "Glen" could there be, except to mislead the public? There are two reasons for using the word "Glen", according to the defendants. First, Buchenbach is the name of a small river in the Buchenbach Valley and "Glen" means valley. Secondly, the distillery is situated in the town of Berglen. Both arguments did not convince the court. "Scottish term for a deep valley in the Highlands"
which would seem to hinder rather than help the Buchenbach distiller. On the other line of argument, that the home base of the Buchenbach distillery is the town of Berglen, I wonder, do the locals perhaps say they live in "Glen". That would help. As to other examples of abbreviating the name of a town by cutting off the first bit of the name, I can think of London-Derry and Kingston-upon-Hull. The Oxford Dictionary defines Glen as "A narrow valley, especially in Scotland or Ireland", so not necessarily Scottish. There is no indication that "Glen" is used as an abbreviation of "Berglen" by locals, however the defendants said it was a play with words to incorporate this in the Whisky's name. Indeed, a "play on words". One might almost say, a respectful hommage to the Scottish origins of a drink now made all over the world. Almost. But even if so, it wasn't purely altruistic, was it, the choice of the word "Glen" in the naming of the product? If one has a nose from it, the taint of free-riding is unmistakeable. I struggle to believe that Geographical Indication for "Scotch Whisky" should properly prevent the use of "Glen +clearly Germanic placename" or prevent the use of a hypothetical image of a Japanese man in a kilt next to Japanese whisky name.